I Heart Hiroshima re-emerge after time apart inhabiting different worlds. Teasing possibilities early 2016 when Sully returned from Berlin. Subsequently recording at Red Star with Dubzy (Blank Realm). The chasm since filled with life, a new sensation rides high in the mix… and a new EP preceding more over the coming year. 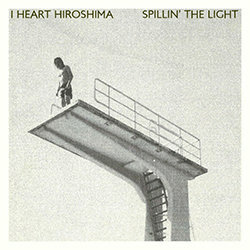 Spillin' The Light out Dec 2. Always a ragged joy of guitars and drums, since 2005 they've strung their self-styled way through EP's - 3 Letter Word for Candy; Cut in Colour - and two albums - Tuff Teeth; The Rip - along with tours/festivals around Australia, Europe, Asia with Conor Oberst, Ratatat, Gang of Four, Shonen Knife, The Rakes, Peaches, Maximo Park, The Mint Chicks, The Grates, Regurgitator. Matt, Cameron and Sull set the pace for a new tune of episodes. "To these ears, the result is a sound that's very "Brisbane": bright, trebly guitars with no effects pedals, strong pop melodies, unusual angles and lyrics and more going on beneath the surface than meets the eye, or ear. If you want to place it in a continuum of Brisbane music, it's the one that begins with The Go-Betweens debut, Send me a Lullaby.” (Noel Mengel). Cruisin' garage pop glory possessed of I Heart's male/female response vocals all with that certain glow! Sweet.